Hi guys, Well we have truly had some amazing weather here the last four ofÂ five days which has given anglers great weather to fish all over the lake and Taupo rivers with with long sunny days and no wind. I have done some guiding this week and been lucky enough to get to the picket fence at Waytoohardanuie 4 evenings in a row which has produced 5 fish. All fish that I have caught here have been jacks which have been in quite good condition, they have all been taken on a bright orange heave and leave slowly retrieved. At the moment it does not seem to be getting dark until about 6.45pm which is giving the guys that finish work at 5pm enough time to get down and enjoy the last of hour of the day. I was guiding on the Tongariro yesterday and once again had a great morning with fresh hard fighting fish from the lower river. 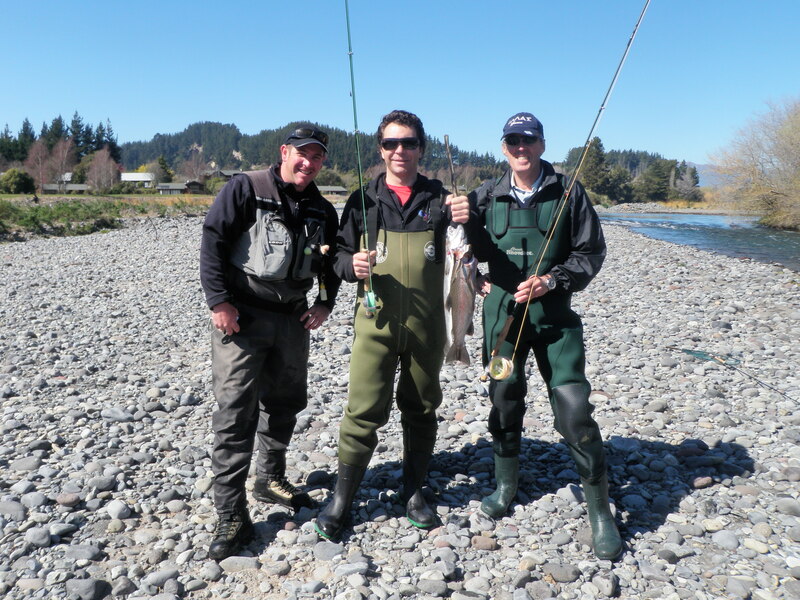 I picked Cameron and John up in Taupo at 8am and headed straight for the tongario and in particular the lower river asÂ Mike had rung through a report of fresh fish in the river with no anglers about, perfect! 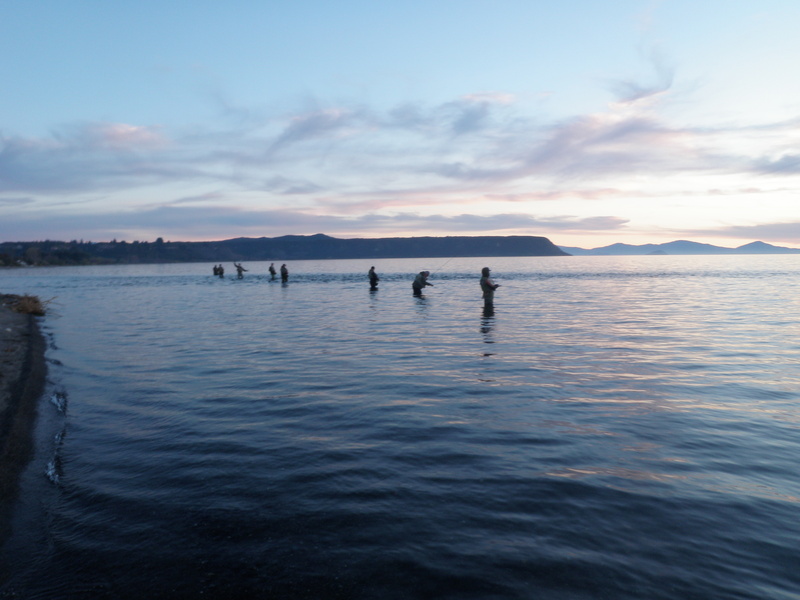 Cameron who know lives in Taupo owns the Burger fuel franchise which is located on our wonderful waterfront and has always been interested in the fly fishing but with such a busy lifestyle and a young new born he has not had the time to explore the options so close to home. Cameron’s wifeÂ Kate thought it was about time he hadÂ a few hours out of the office and purchased a guide as part of his first fathers dayÂ present. Cameron and John had not fly fished before but had some experience in spin fishing and catching Tuna of the coast so the drive to the river was pleading with them not to try and pull a trout in like a Tuna. Half day bookings are difficult to get both anglers up to speed especially when they have not picked up a rod before but luckily for me Mike was about to give a me a hand forÂ a few hours which both I and the clients really appreciated and it was not long before they were both casting enough to encourage a strike and hook up. 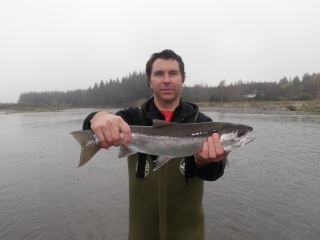 As we knew fresh fish were trickling through and it was a overcast misty, cold morning we stuck with a traditional winter nymph rig and used a weighted bomb and small pink glo bug in behind. It does not matter what time of day you use glo bugs, if they are working stick with them all day and don’t feel you have to change to naturals just because it is low and clear. During our morning on the river Cameron and John managed to land 3 fish which were all in great condition and were taken home to boast and enjoy with the family, quite good going for beginners don’t you think? I think the key to getting beginners into fish is to stay away from the crowds and fish smaller pieces of water which have been over looked by anglers rushing about trying to cover all the main pools, check out the water we fished in one of these photos. With the end of our good weather expected tonight and the arrival of some rough weather and rain tomorrow maybe we will see a few more fish enter the system for the weekend but it really depends on how much rain we do get and which direction that wind comes from. 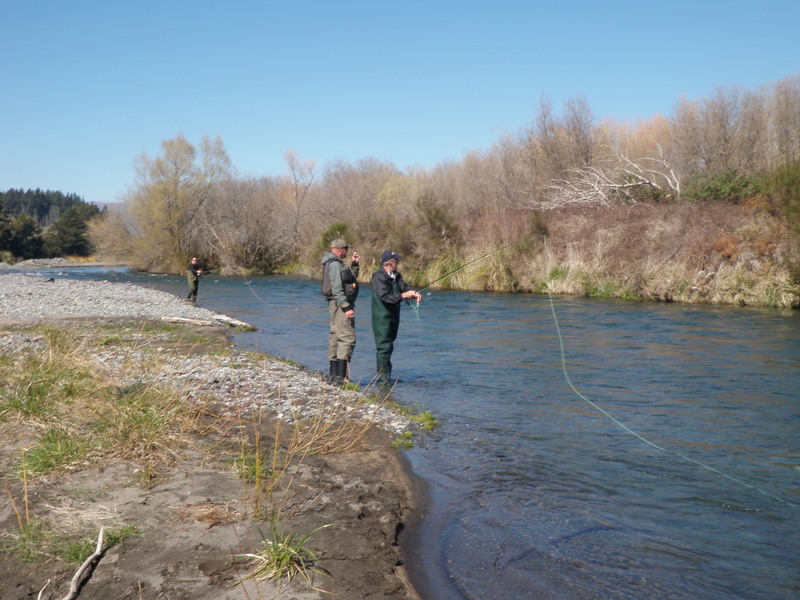 I dont think the winter is over and I think we will see Taupo rivers in flood again before settled warmer weather comes which see the last of the main runs of spawning fish coming in the rivers. Yesterday we saw a few mayflies hatching from the river which is a good sign so eyes should be peeled for rising or film feeding fish. This is where small naturals will work very well and nymphs such as hare and coppers, PT variants and Caddis will be accepted time and time again. If there was two flies I could have in my box to fish anywhere and everywhere it would be a hare and copper and pheasant tail as they must get accepted for all different nymph life. These are my favourite patterns to use under a dry fly as a dropper while fishing pocket water in most backcountry waters and also the Tongariro in places like the fast water from the Blue water to the Sand pool which rarely gets fished and many overlook. Good reports have flooded in from the Waimarino and even one angler telling me about some good fish in the Waiotaka which he was managing to haul out of the snaggy runs. 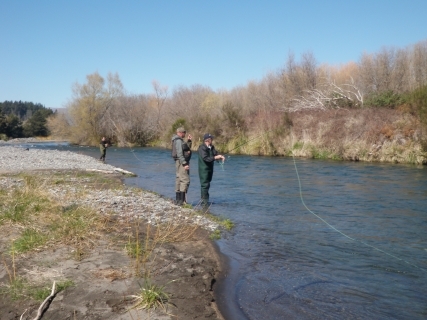 I have not done a great deal in these rivers but I do know the Waiotaka can be hard if you dont know where or what you are doing, just take plenty of flies and keep retailers happy in these tough times. The Waitahanuie has got trout in it but alot of these fish seem to be jacks for some reason which is a good thing, maybe the hens will follow with the rain on Friday. Lower reaches have been fishing a little more consistent than the upper so just park at the road and polaroid your way up until you start seeing or getting into fish. Once again I have no report on the TT but should imagine last week would have been good in there with the extra flow and coloured water, plenty of cars lined up by 7am on most mornings. I have a busy weekend with guiding so will do my best to get a report to you all early in the week with the results of time spent on the Tongariro. Weather should be turning for the worse but dont let that turn you off, it may make things better?